The latest molecular entity that BIOSYNTH has featured on its website is bulbocapnine – deadly for cattle but psychoactive for humans and also useful in modern medicine as an alkaloid that can be used to treat a range of muscular-related conditions. Bulbocapnine is an isoquinoline alkaloid that is found naturally in the roots of Corydalis poppies from the Fumariaceae family or Dicentra poppies from the Papaveraceae family. It can also occur sporadically in the Solidago spectabilis ‘goldenrod’ herbs that grow across the Western USA. Its physiological effect is as a toxin. More precisely it acts as an acetylcholinesterase inhibitor, increasing neuromuscular transmission and spasm, and as a tyrosine hydroxylase inhibitor that blocks the effects of dopamine on peripheral dopamine receptors. Taken together, these can directly cause transient syndromes of frenzy, convulsions, tremor, opisthotonos spasms and hypertension, salivation and vomiting as well as a range of neurodegenerative effects. For thousands of years, farmers have learned to keep their sheep and cattle away from ‘crested lark’, ‘bleeding heart’ or ‘Dutchman’s breeches’ poppies because direct ingestion can kill the animals, due to the bulbocapnine they contain. This is particularly true of the Fumariaceae or Papaveraceae derived strains of bulbocapnine. In the Solidago goldenrod plants, it is less lethal since the active substance mainly occurs between August and December, with the plants safe for ruminants to eat at other times of the year. Bulbocapnine acts as an acetylcholinesterase and tyrosine hydroxylase inhibitor in mammals including humans. Due to these properties it induces catalepsy and inhibition of reflexes and motor activities of striated muscles, leading to extreme symptoms such as the opisthotonus ‘arched back’ pose typical of tetanus, severe hypertension or spasticity. Bulbocapnine hydrochloride (Biosynth catalog number B-9400) can thus be seen to be a very potent molecule and, less obviously, to be potentially a very useful one. As an acetylcholinesterase inhibitor (AChEI), bulbocapnine has powerful effects on muscular mechanisms that can be both a curse and a blessing. Acetylcholinesterase inhibitors occur naturally as venoms and poisons and can thus be used as nerve agent weapons or insecticides. However, they also have a wide range of therapeutic applications that range from antidotes to anticholinergic poisoning to increasing ‘lucid dreaming’ by decreasing rapid eye movement (REM) during sleep as a treatment for autism. Current applications of bulbocapnine as an alkaloid include treatment of myasthenia gravis musculoskeletal weakness, being used to boost neuromuscular transmission, and similarly to treat glaucoma, postural tachycardia syndrome and nystagmus, the involuntary eye movement that may cause impaired vision. Neuropsychiatric applications can exploit the properties of AChEIs in affecting the role of acetylcholine in cognition in the central nervous system (CNS). Thus bulbocapnine can act to attenuate psychotic symptoms such as visual hallucinations and treat the cognitive memory and learning deficits that are typical of dementia as well as the apathy associated with Alzheimer’s disease. 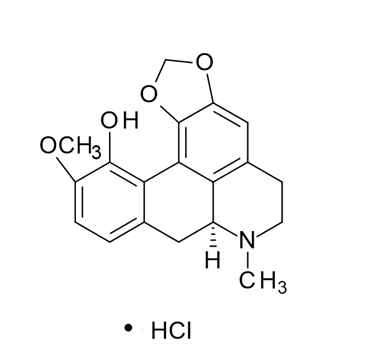 As a tyrosine hydroxylase inhibitor, leading to impaired synthesis of dopamine as well as epinephrine and norepinephrine, bulbocapnine could have a significant role to play in understanding the epidemiology, genotype/phenotype correlation and outcome of neurodegenerative disorders such as Alzheimer’s, Parkinson’s and Huntington’s disease in which tyrosine hydroxylase has a close relationship with 14-3-3 proteins. Additionally, altered tyrosine hydroxylase enzyme activity may also be involved in Parkinson’s, along with Segawa’s dystonia and schizophrenia. Click on BIOSYNTH Molecule of the Month: Bulbocapnine for more information.